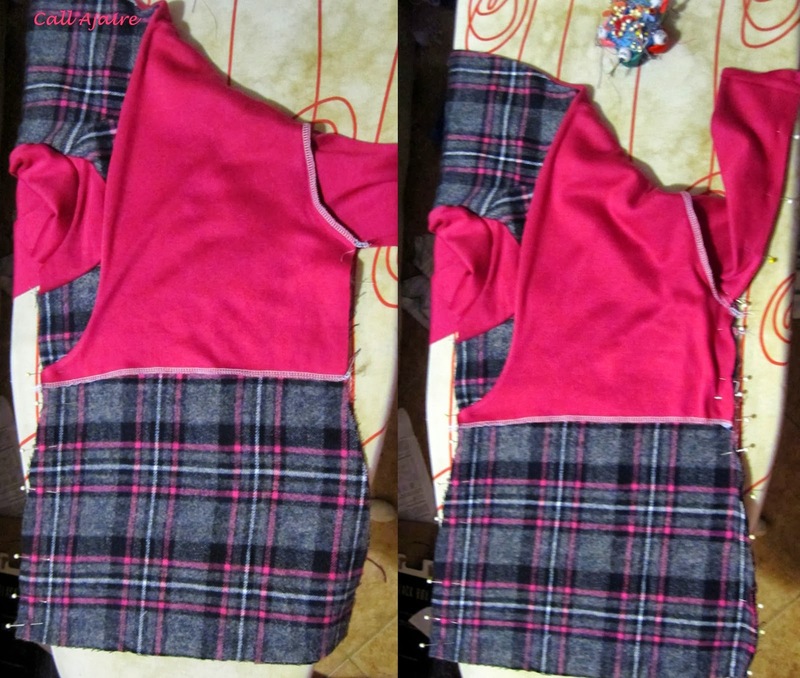 While I await my fate (hehe), I thought I’d post a bit about how I flipped the BBC Vest into the ABC Shawl Collar dress. The shawl collar is adorable and it couldn’t have been done without the perfect roll collar of the original vest from Shwin Designs. In fact they flipped it themselves and now have the Paperback Writer Cardigan which uses the same collar shape. I might have to grab that pattern too. 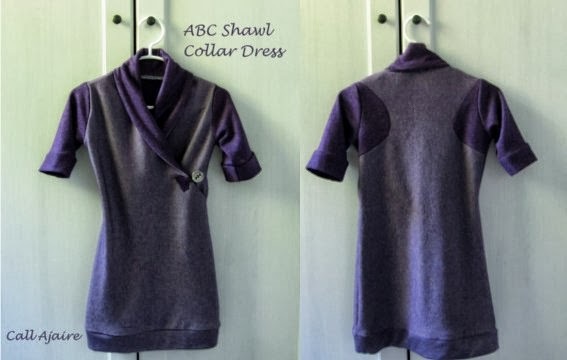 I decided to make another ABC Shawl Collar Dress with the original fabric I had intended to use for the flip. 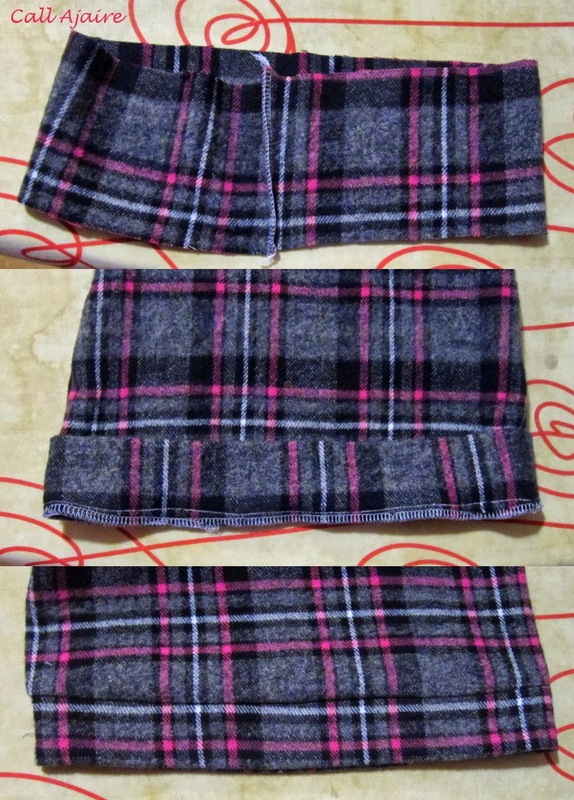 Since it was a lovely plaid I found at JoAnn fabrics, I thought it would be perfect for the Mad About Plaid themed week at Project Run & Play so I made the original out of the stretch purple fabric and held onto the plaid. 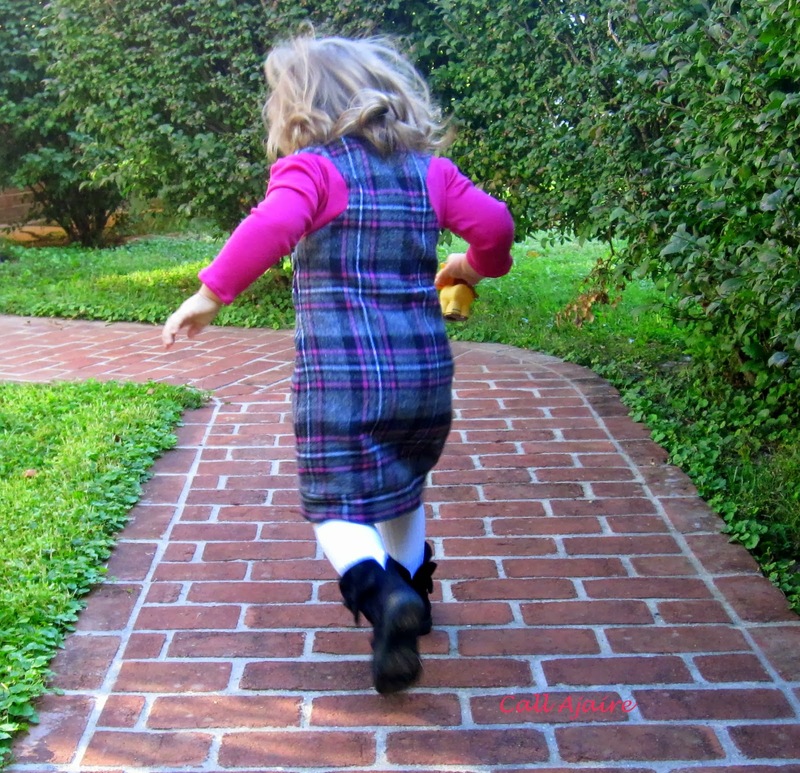 This week I decided Bean needed a long sleeved (not just three quarter sleeved) version of the dress so I reached for the plaid and a coordinating knit and made another dress. This one was surprisingly quick to make, but I decided to take some pics as I went along to show the steps I took to make the flip. FYI, there are some affiliate links in this post and they will be marked with an asterisk *. As I mentioned in the original post, I used the basic shape of the Anywhere Dress* since that is one we love over here. It works so well for knits and I knew with a banded bottom edge it could feel like a comfy sweater dress. Since the front of the dress would be faux wrap, I needed to trace both sides of the pattern to get one full front piece to flip. Then I overlay the front vest pattern piece to mark where the original shoulder and collar of the BBC Vest would be (green line shown below). I wanted a slightly fuller collar and it needed to extend to the edge of the dress to create the faux wrap, so I added width along the line of the original pattern (about and inch and a half shown in purple above) and tapered the edge to the side seam. Keeping in mind that the collar will be folded over when worn, I made sure the “tapering” was a little steep at the edge. Also, I didn’t want Bean to have to wear a shirt underneath this dress, which is why the collar needed to be fuller than it was on the vest: to limit exposure at the neckline. Another thing to keep in mind when “frankensteining” (thanks to Once Upon a Sewing Machine for the term, hehe) patterns is the individual seam allowances. In this case both original patterns used 3/8″ which is what I normally use as well so there wasn’t any additional adjustment to be made. But it could be an issue if you don’t consider it. Once I had one complete front piece, I used that piece to create the pattern piece which would go under the front and cover the other shoulder to created the faux wrap. 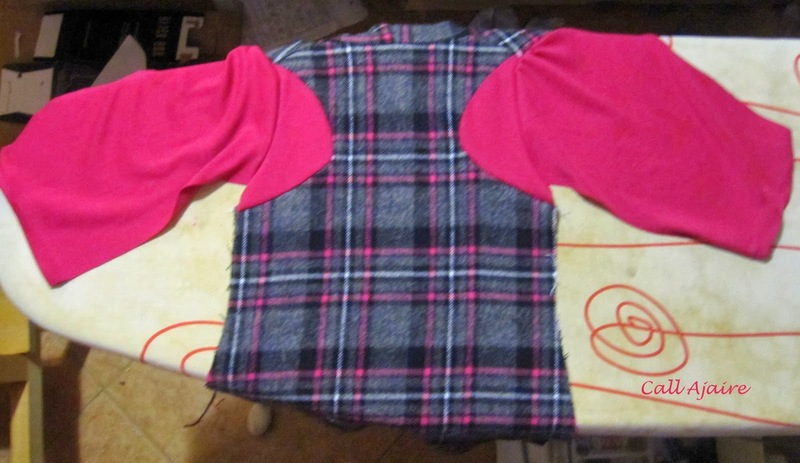 I simply cut the piece across the bodice (shown in pink above) about an inch below where the collar edge meets the side seam. 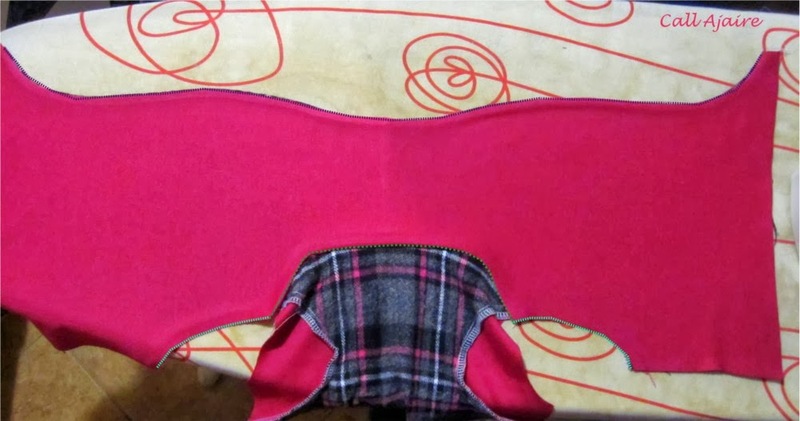 This creates a double layer across both sides of the bodice front, but as it is meant to be worn on a cold day I welcomed the extra warmth it would provide. Containing the edge in the side seam was the best way I could think of to keep the wrap from bunching at the front. For the lining I took the same pattern piece I used for the left front except I cut off 3/8ths of an inch from the top neck seam and cut one full lining piece on the fold. The back of the dress was made from three pieces. 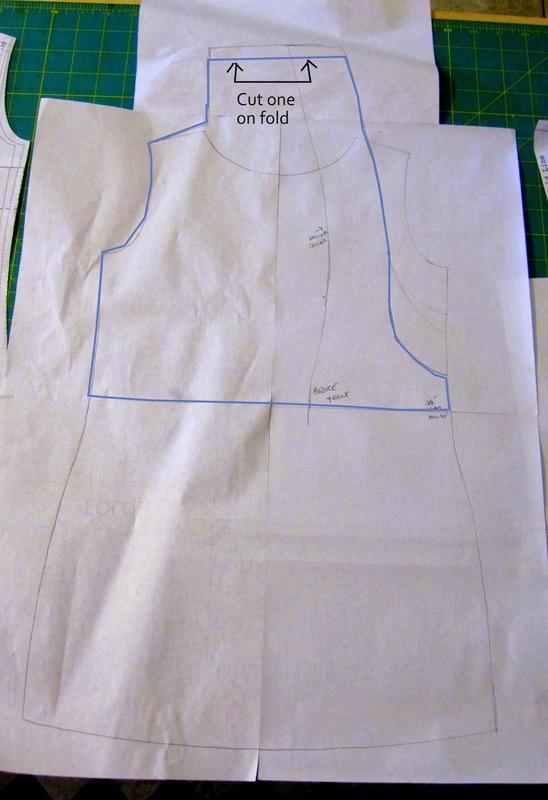 I took the Anywhere dress pattern and overlay the racerback vest pattern piece so I could mark the shoulder blade cut out areas. 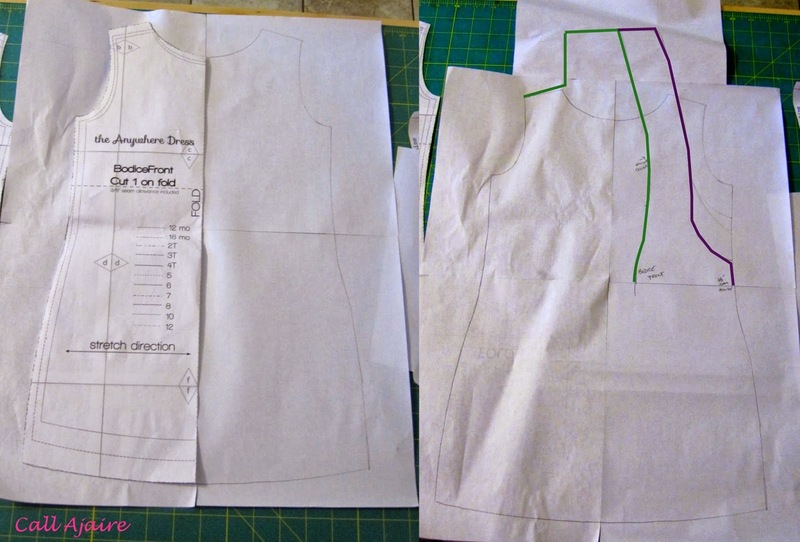 Then I used the cut out shape (adding seam allowances) to create the color blocking pieces which filled out the remaining Anywhere dress pattern. Adding in the Anywhere dress sleeve (which would fit perfectly since I used the existing Anywhere dress pattern arm holes in both the front and back new pattern pieces) I finally had all the pieces I needed to make the ABC Shawl Collar dress. The first step to assembling the dress is to make the racerback. Pin well and then sew the two color blocking shoulder pieces to the back. 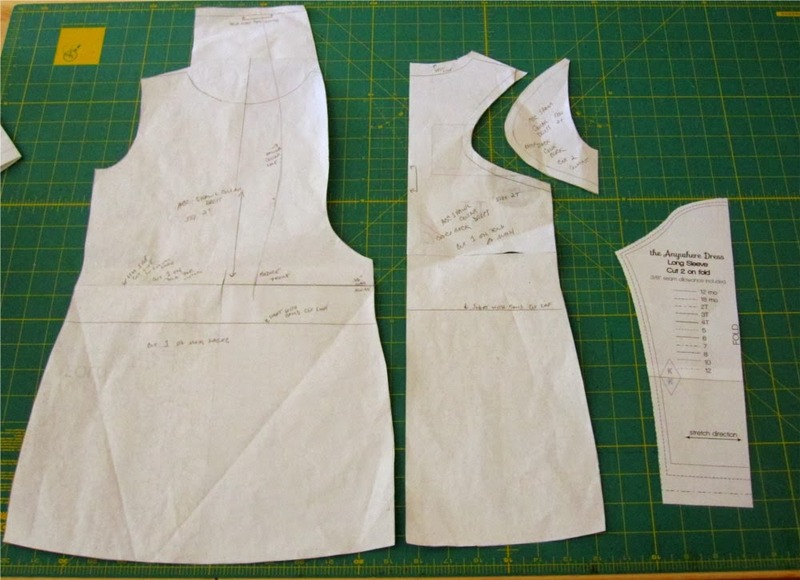 In order to not just recite Shwin Designs’ pattern (I highly recommend buying it*) I will say to get to this point just follow the pattern instructions Steps 1 through 5. The only difference will be that one of the front pieces will be short and one will be the full length of the dress. To attach the lining you will also follow the instructions, but just step 9. 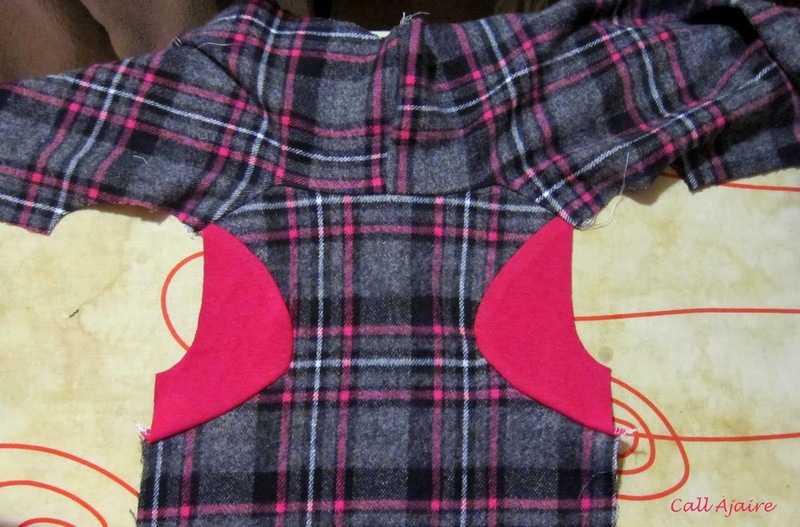 Sew the lining to the main body along the purple dotted line above. Leave the blue dotted lines at the arm holes open and not sewn together. 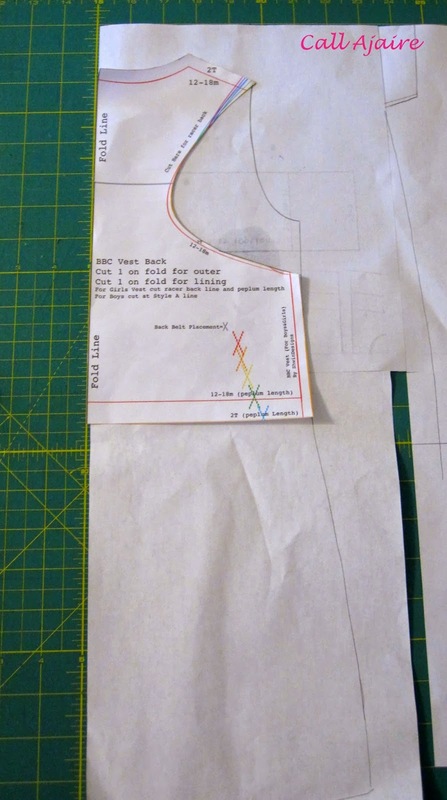 You should hand sew the lining along the green dotted line at the back neckline to hold everything in place since there isn’t a back lining to attach it to. You could also sew through the layers along the same line instead of hand sewing, but I preferred the hand sewn invisible seam. Next attach the sleeves through the main and lining layers just at the arm hole. Assembling the dress you need to keep in mind the faux wrap and which side should cross over which in order for everything to be sandwiched correctly. As I learned while quilting, remember that whatever layer you want to be the middle of the sandwich should be on the top when sewing together. So start with the back right side facing up. Then bring the full length dress piece over, pinning the sleeve edge down to the bottom of the skirt. Also pin the other side from the bottom of the skirt up to where the wrap ends, attaching it to the back piece. Pull down the other side (the short side) and pin from the sleeve edge down to the waist line where that side ends, catching all the layers. Then pin the other side which is only a short section, but again catch all the layers. Sew both seams all the way from sleeve edge to the skirt bottom. Now that everything has been assembled in the correct order when you turn it right side out it’ll look like the picture above. 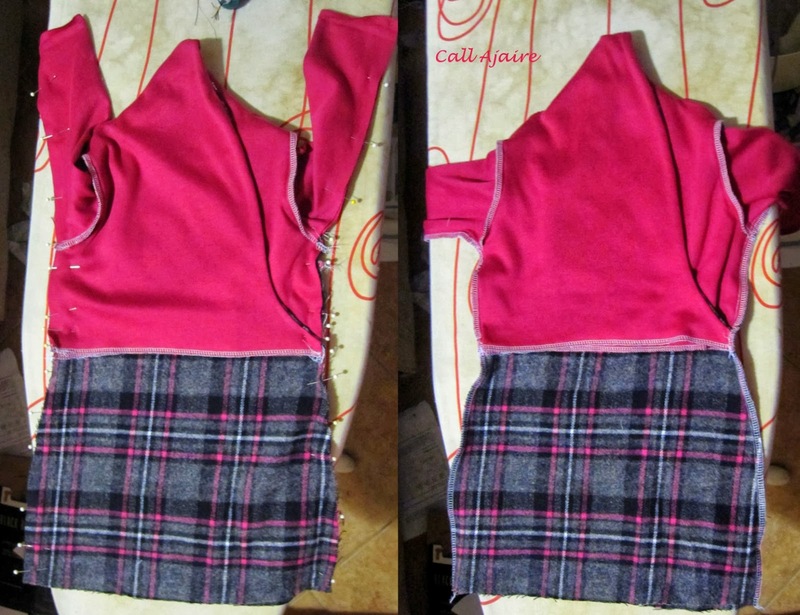 Fold over the collar so it looks the way you’d like and get ready to attach a button loop and button. The button is for decoration only, but I think it makes the dress a little more special so I recommend doing the extra step. For the button loop first create a little house shape from scraps of fabric and sew them together. Decide where you’d like the button and loop to connect and pin the “house” wrong side up pointing the opposite direction. Pin through all the layers of the front section of the dress, making sure not to catch the back. This also helps to secure the layers and prevent additional bunching. Sew a line across the house to secure it to the front. Then fold it over, press it in place, add a loop of elastic and sew along the edge of the shape to contain the elastic and raw edge of the house. Sew the button in place and loop the elastic around it. The only steps left to complete the dress are to hem the sleeves and bottom of the skirt. I prefer to add a band to the bottom which is easier than hemming and adds to the sweater dress feel of the dress. I love the cozy feel of this dress and am excited for Bean to have two in her fall/winter wardrobe this year. 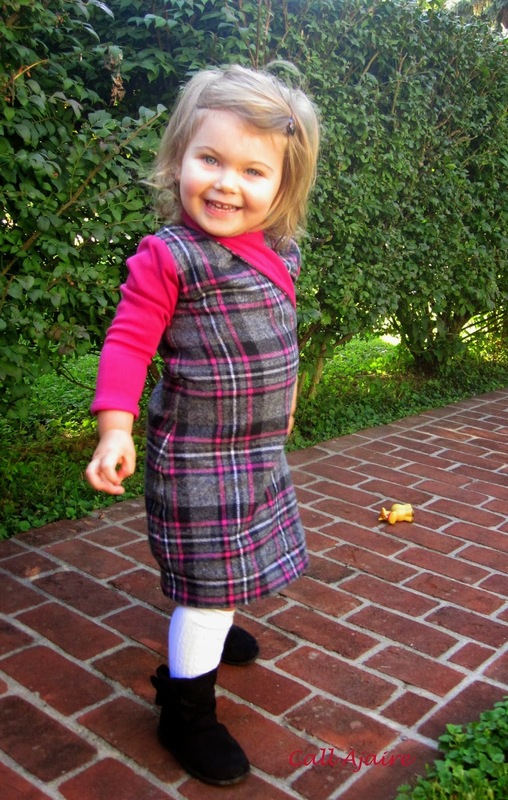 Plaid is a pain to work with since it takes extra time to line everything up, but it looks so adorable on a little girl, that I’m happy I took the time to make the original dress I had in mind. Since I’m submitting this in the sew-along for Project Run & Play, I’ll link you to all the other sew-along-ers. I can’t wait to see what everyone makes with all the fun plaid fabrics there are this season! I like how the sleeves are different so it looks like she's wearing a jumper. And those boots just crack me up! Omg! You are ON FIRE!! Is there a word for it when everything you make comes out awesome? The opposite of a sewing slump. That's what you're doing! It came out so cute!! I love that plaid! I'm so glad you made another one of these dresses because it is just adorable! The color combo is just perfect and it looks so cozy! And it looks like she loves it. I loved your original at Flip this Pattern – and I absolutely love this version even more! Two fantastic dresses! Thanks for showing your pattern work too! Really adorable – love the color combos and perfect for the season! This is SO cute! I actually like this one better than the purple one. Way to go Momma! Love how you modified the pattern. The dress is absolutley adorable! Well done! I'm excited to see all the plaid, I agree it's so cute on little ones! Love your remake, good luck on the Flip competition! First in the PR&P linky party?!?!? What is this world coming to?? Most of the time we are 'sweating the deadline' for you!! Looks like another super comfy dress for Bean! Ajaire, you sure you did a really great job. It turned out beautiful and is oh so very stylish. great tutorial! I'd be tempted by the pattern if it didn't cost so much, I'll have to figure out how to get this look using my own patterns that I already have. P.S. I love your plaid! Oh, Cute!! And it looks very comfy too. Beautiful job! awww I love it. the back is so creative, love the colors!! Love it! I adored this flip! 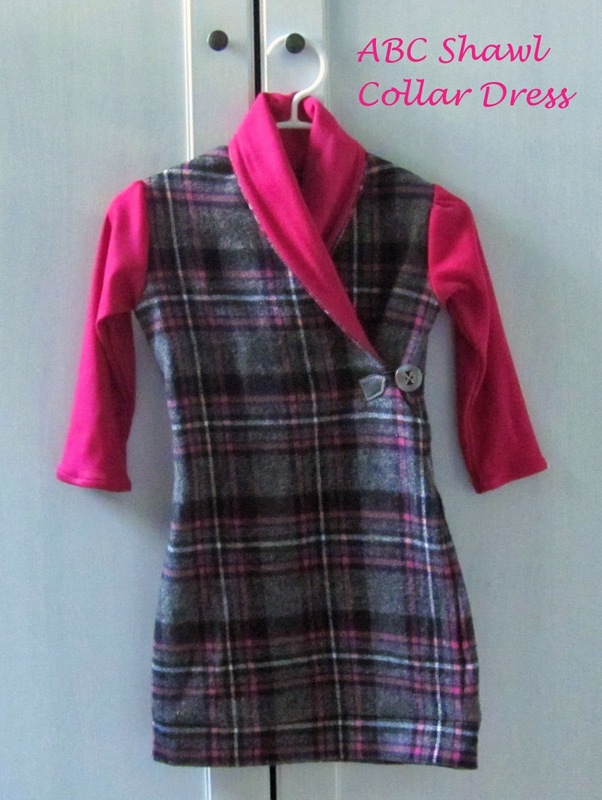 I agree…this does look like a comfy dress and perfect for fall/winter! Cozy looking! Thank you for sharing with the Clever Chicks Blog Hop!